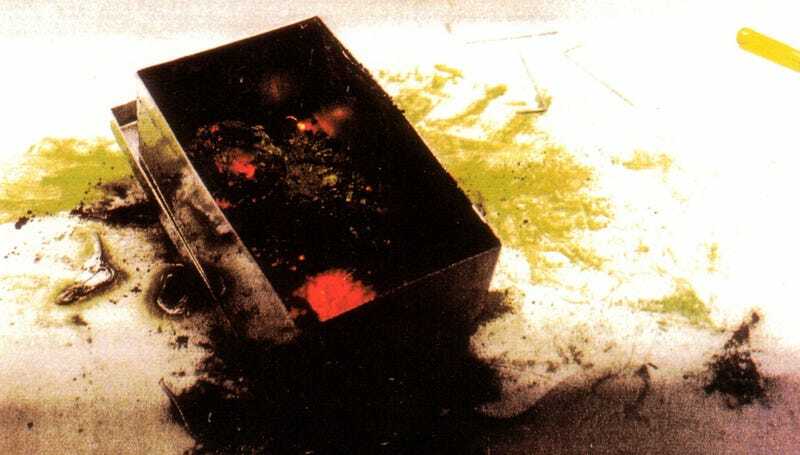 Why is This Block of Plutonium Glowing Like an Ember? This block of plutonium appears to be glowing like a hot coal. Not a good sign! The glow is due to a property called pyrophoricity. A pyrophoric material will burst into flames when it comes into contact with everyday materials like water and oxygen. Plutonium has a high level of pyrophoricity—so much that it has caused serious fires at energy facilities. Those fires aren’t caused by blocks of plutonium. They start when finely ground or thin sheets of plutonium allow a lot of contact with the air. Basically, we’re talking about plutonium kindling. Larger blocks of plutonium pull the trick we see above. Spots on their surface begin to appear, making them look like embers inside a fire. They’re oxides, which means they’ve reacted with oxygen the same way iron reacts with oxygen to form rust. It’s not immediately obvious because it tends to happen slowly, but the formation of rust is an exothermic, or energy-releasing, reaction. When plutonium oxidizes, that reaction is exothermic, too—but the results are a lot more violent. Plutonium reacts with air two different ways, simultaneously. First, we get plutonium dioxide, or PuO2. Three molecules of that react with one atom of plutonium to get converted to three molecules of Pu2O3. Here’s what it looks like. Meanwhile, oxygen goes to work on the trioxide. Oxygen gets added to one molecule of the Pu2O3, splitting it back up into two molecules of PuO2. This is a reaction that can just keep going, as long as it has the right ratio of oxygen and plutonium. But as the temperature climbs to 150°C–200°C, increasing amount of Pu2O3 can cause the entire thing to heat enough to burst into flames.